The white wine is a bit of a departure from most recipes for this dish and you can substitute rice wine (or just omit the wine component entirely if you like). I actually don’t have any rice wine in the house at the moment anyway but I have made this dish with white wine many times now and I like it very much. 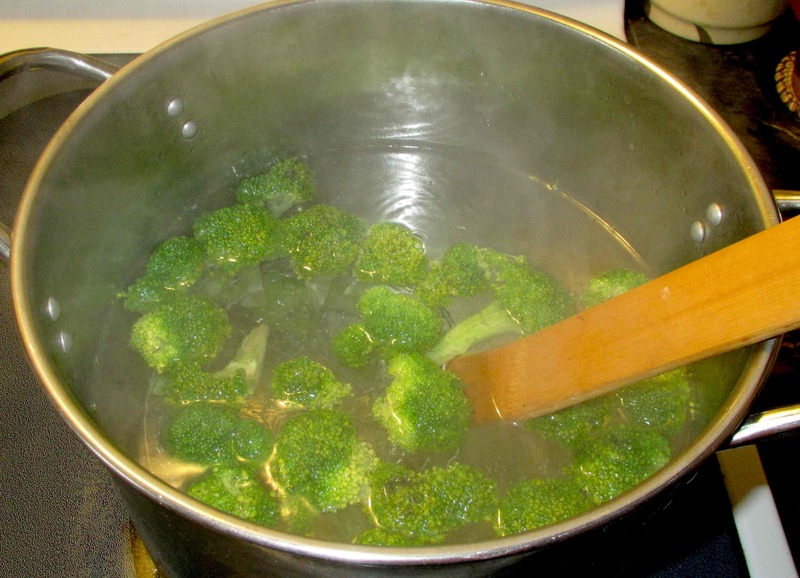 Our first task is to blanch the broccoli. Heat a large pot of salted water on the stove and have ready another pot or basin of ice cold water near to hand. When the water comes to the boil, add the florets. Let them blanche for a good 30 or 45 seconds and then toss in the tablespoon of baking soda. Stir for a few seconds and then immediately drain the pot and put the florets into the ice water to stop the cooking. Drain once the florets are chilled and set aside. 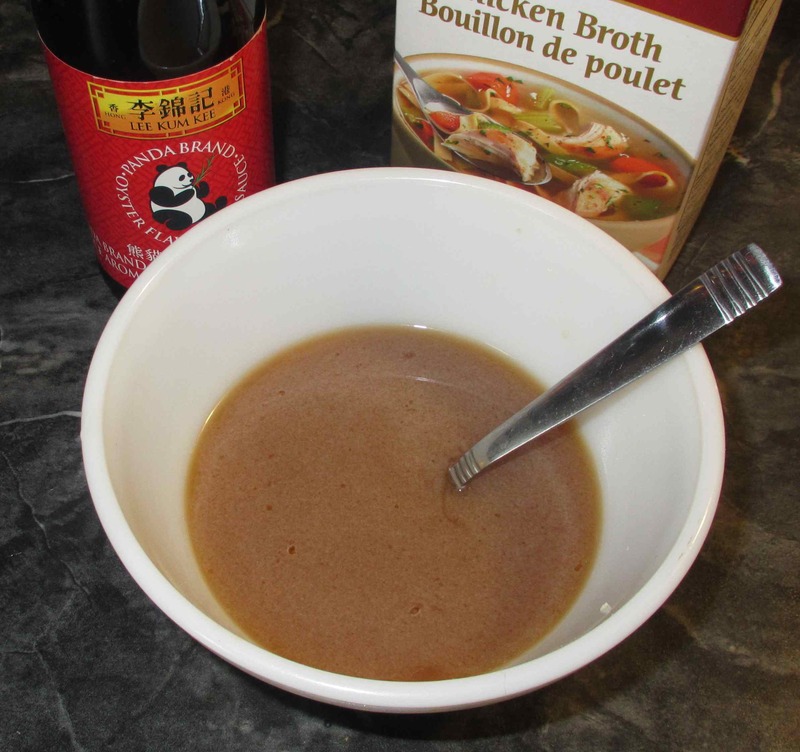 Make a sauce by combing the stock, wine, oyster sauce, sugar, and the single teaspoon of cornstarch in a bowl. Mix well, making sure the cornstarch doesn’t ‘clump’ and set aside. Pound out the steak to tenderize and then cut it into small sections. You want pieces that have a surface area roughly about the size of two postage stamps and are no more than about 3 or 4 millimeters thick. Mix together the remaining baking soda and cornstarch along with just a pinch of salt and toss the meat with the mixture, coating all the pieces well. Leave to sit for twenty minutes or so. 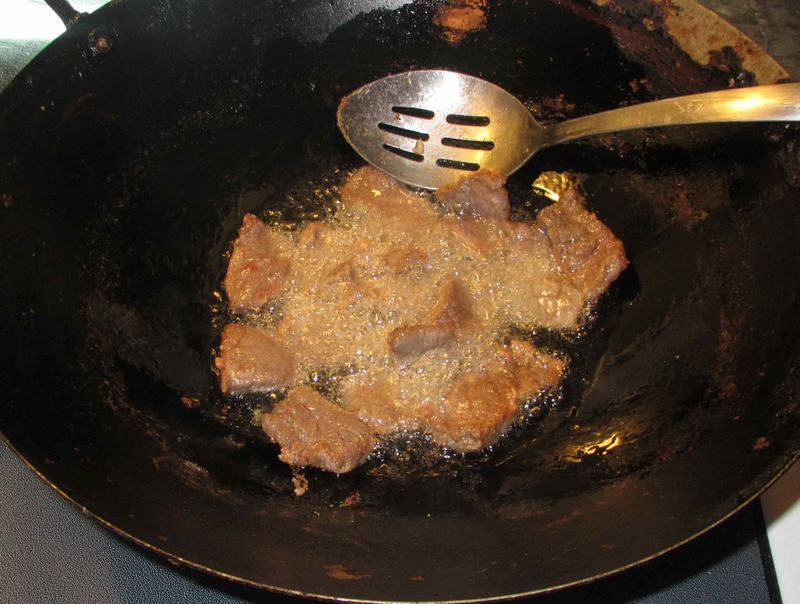 The baking soda will further tenderize the meat and the cornstarch will give it a nice texture when fried. 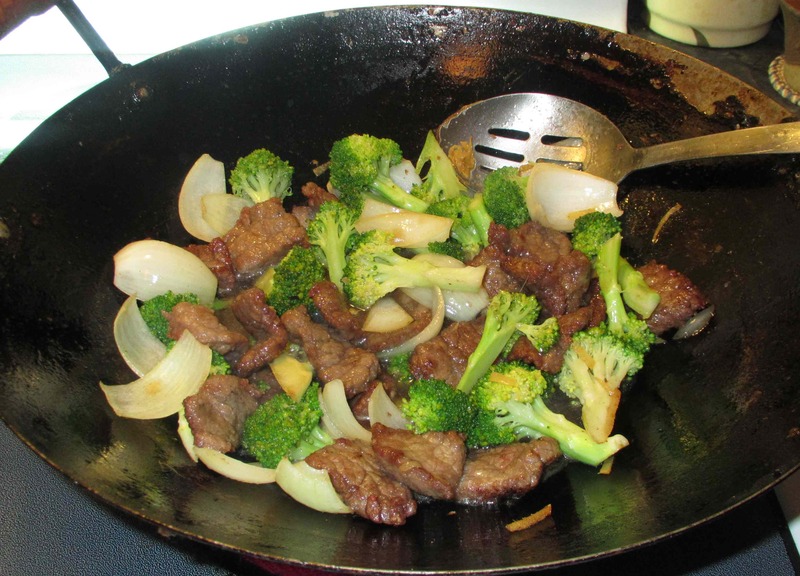 When you are ready to cook, heat your pan over a moderately hot flame and add a half cup of cooking oil. 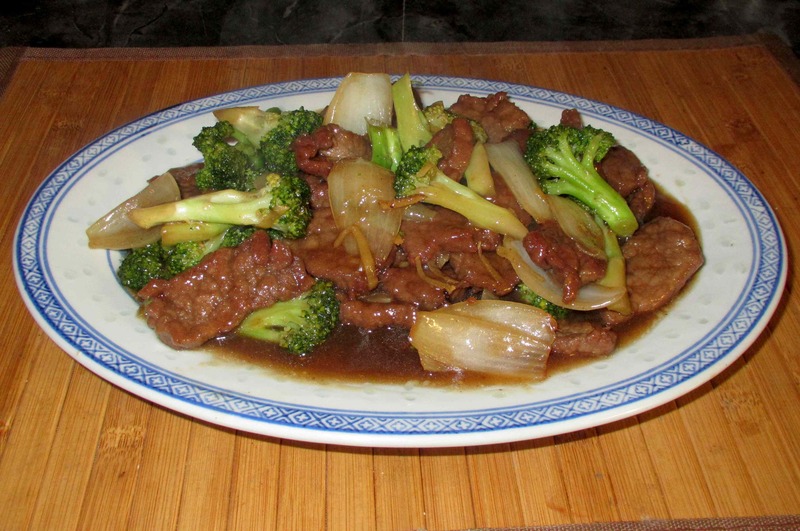 When it is hot, cook the meat slices in two batches, stirring well to keep the pieces separated. 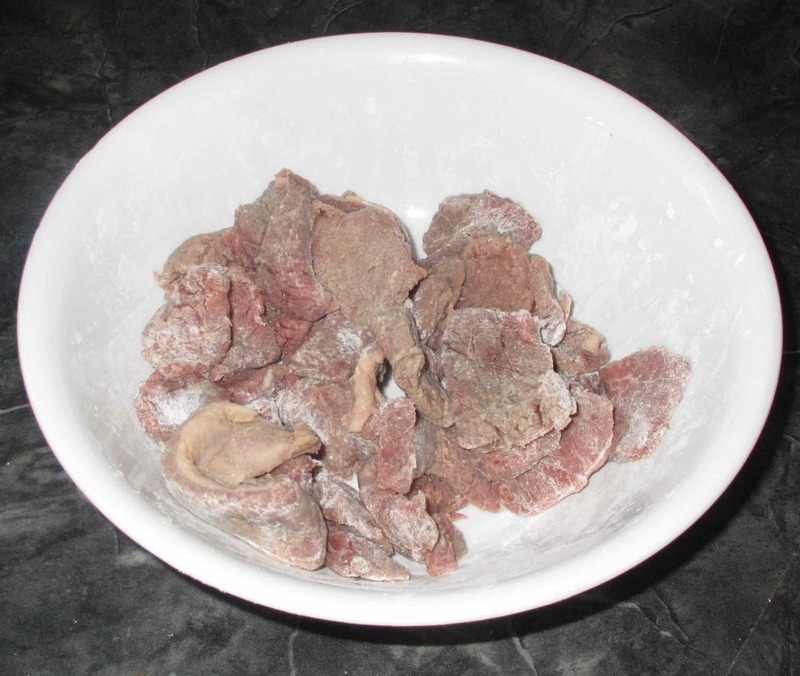 As the batches get nicely browned and just a little crispy at the edges, remove the meat to a bowl. Drain the pan of all but a tablespoon or so of oil and add the ginger. 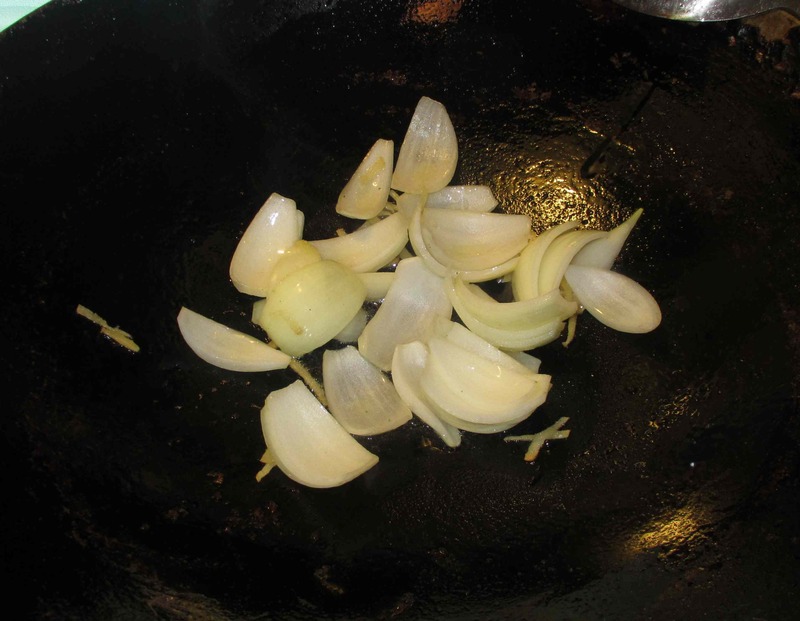 When it gives off its aroma, add in the onion and stir well for about thirty seconds or so. Add the broccoli and stir until the florets are nicely heated through. Add the meat, stir for a few seconds more and add the sauce mixture. Continue cooking for two minutes or so until the sauce is slightly reduced and thickened. Plate and serve immediately. 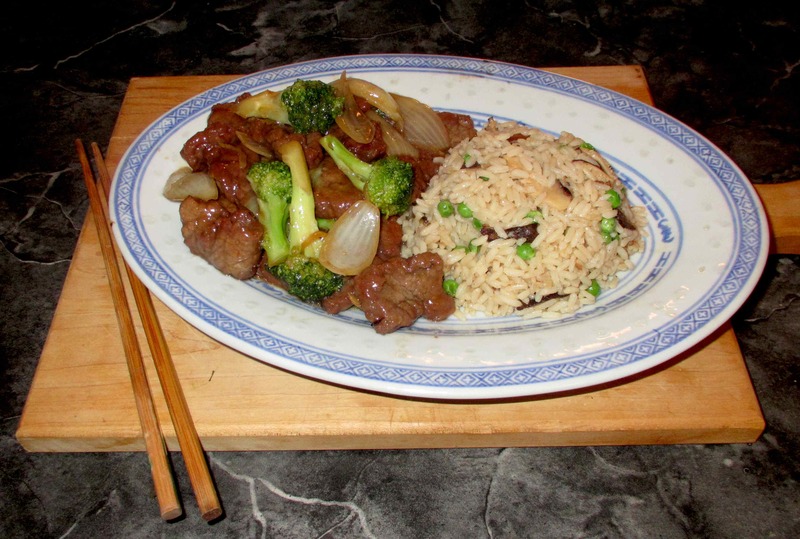 I served this dish with rice fried with peas and mushrooms and I have to say that it turned out to almost be my best. I say ‘almost’ because there was a slight imbalance in the flavor. This is the first time I have used the ‘Panda’ variety of Oyster sauce and I should have tested it first as it was less salty and quite a bit sweeter than other brands. Next time I will know to adjust for this. Still, the end result was pleasing and my wife and I enjoyed it very much. Please give it a try …. Ooooh, this looks delicious! I very much want to try it! Thanks for all the step-by-step stuff, I would have had no idea to use baking soda, I’ve never seen it in a recipe like this. Thanks. I use it from time to time, especially with tougher cuts. 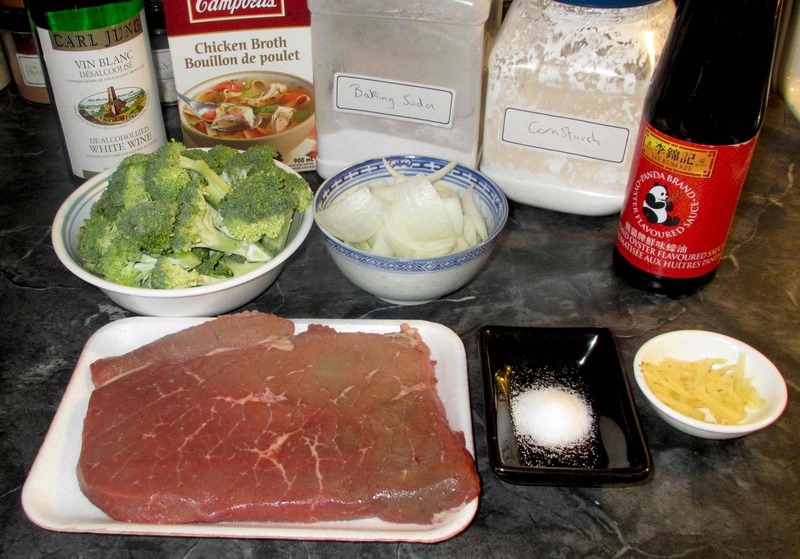 Go easy though… the half teaspoon I used is absolutely the most you would want for this small amount of beef. looks very nice! this is exactly how I would make this dish except that we don’t add baking soda.Usually, restaurants will use baking soda. As to the Panda oyster sauce, it is cheaper, but I am still sticking with Lee Kam Kee which has increased the price outrageously in recent years! I won’t buy the Panda brand again, I don’t think. LKK is okay but there are others I prefer… I must do a post on the brands I like sometime. I only know LKK? What is the other ones? There are a more than one I like but none in the house and I can’t recall the names for the life of me right at the moment…. I’ll post when I see them. Thank you for this informative post. I have never attempted to make this dish, but have had it in a restaurant and I love it. With your step by step guidance I will definitely make it now. It looks delicious! It’s one of my wife’s favorites …. always a good one for a Chinese dinner party. This isn’t usually one of my favorites either, but right now, just before breakfast, this looks like something I want NOW. I will give this a try this weekend. It looks really good but I use the Lee Kam Kee sauce as well and will continue to use it…..although pricey, but worth it. Good to know about the taste of the Panda for future reference. Nice informative piece. Thanks. Thank you very much … I was meaning to do this post for ages and finally got around to it! However, clearly that was a phase! I made this tonight, and it was delicious. I’ve never used baking soda for the meat, just cornstarch. And it makes a difference, as does blanching the broccoli. Question: you mention using sugar in the description of making the sauce, but it’s not in the list of ingredients. What kind and how much sugar should I use? Love the step by step instructions, very helpful! Duh! … I make mistakes like that occasionally. Writing recipes is *so* much harder than actually cooking! Thanks! I think you do a great job on writing the recipes. I really appreciate the step by step instructions and photos. Next up is your Kung Pao Chicken. My husband loves your blog because he says he’s eating very well as a result! And I like it too! I’ll look forward to the Shrimp with Cashews!